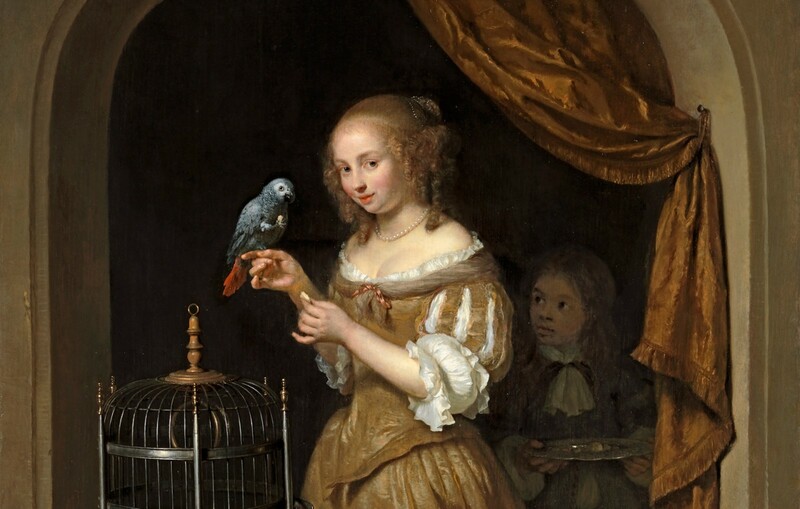 Caspar Netscher’s Young woman feeding a parrot, 1666, sold by Richard Green to the National Gallery, Washington DC last year, is a highlight of “Vermeer and the Masters of Genre Painting” at the National Gallery of Ireland, Dublin (17 June-17 September). Ten Vermeers are put in the context of his brilliant contemporaries, including the short-lived Gabriel Metsu. The exhibition inaugurates the National Gallery of Ireland’s reopening after a spectacular, six-year-long refurbishment. 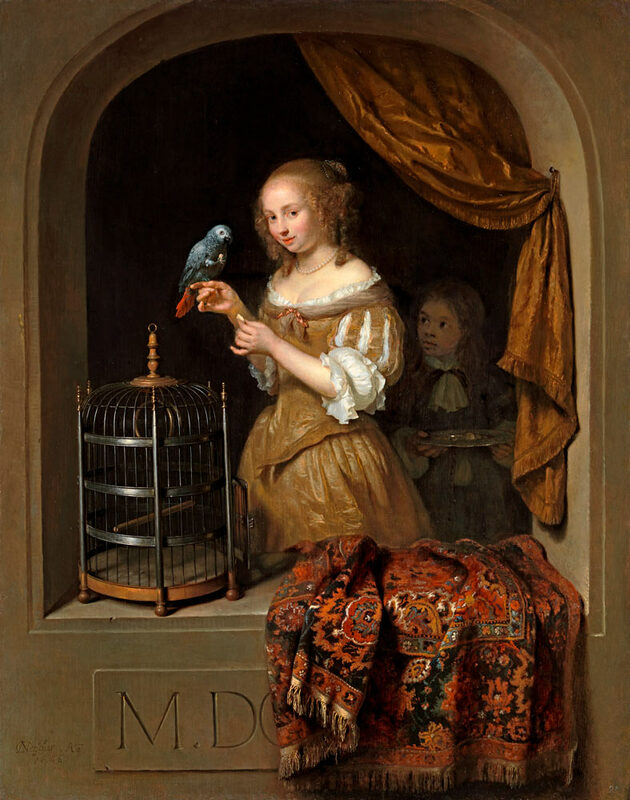 A young woman, dressed in the height of fashion, feeds an African Grey parrot, an expensive, exotic pet obtained by Dutch traders from West Africa, prized for their ability to mimic human speech. In paintings, parrots had associations of luxury and sensuality, in keeping with the demurely flirtatious glance of the girl. Netscher sets the scene in an arched stone window. This enables him to show off his credentials as a trompe l’oeil painter by flinging a costly table-carpet over the ledge, to intrude into our picture space. It makes the young woman more seductive by placing obstacles between her and the viewer – is she real? Does she belong to our world, or a painted one? The page boy hovering in the shadows evokes a hinterland which we will never explore. This painting has been coveted – legally and illegally – throughout its history. It is first recorded in the collection of Pierre Plongeron (d.1694), Chamberlain to the Elector Palatine. In 1944 it was stolen by Hermann Goering and was only restituted to the heirs of the pre-War owner, Hugo Andriesse, in 2014. 350 years after it was painted, the public enjoyed A woman feeding a parrot in the National Gallery of Art’s exhibition Drawings for Paintings in the Age of Rembrandt (4th October 2016-2nd January 2017). It was paired with Netscher’s pen and wash ricordo drawing, made by the artist as a record of his composition after the painting was sold. The drawing was on loan from the British Museum, London, but Netscher’s gorgeous oil on panel will take its place permanently in Washington DC as a jewel in the National Gallery’s outstanding Dutch genre collection. Currently it can be seen in the National Gallery of Ireland, Dublin, 17th June-17th September 2017, then travelling to the National Gallery of Art, Washington DC, 22nd October 2017-21st January 2018.